The night before departure we made a list of everything we need for the trip. The next morning we started accumulating: tent, sleeping bags, food, dry suits, emergency paddle, cameras, extra batteries, memory cards, GoPro. All with the support of people who wish us well, noting their enthusiasm and a bit of worry. We forgot to bring a map. ‘Details’, we joke. Somehow it didn’t make the list. The same can be said for a box of 6 bottles of Malbec, but we did bring those, for ‘weight purposes’. Or matter of priorities. 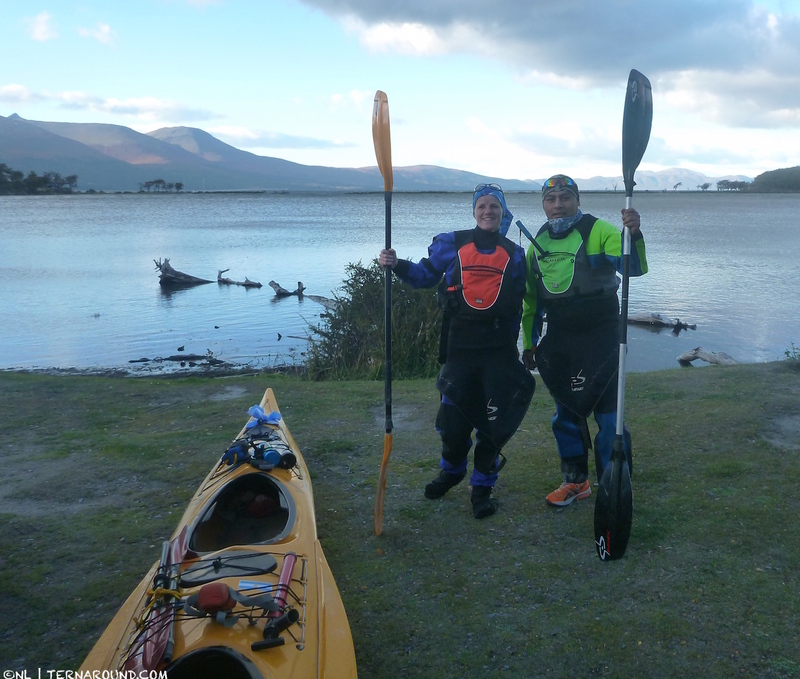 The guys of Rayen Aventura take us and our expedition kayak to Bombilla bay at the Fagnano lake, about 80 kilometers away from Ushuaia. We drink some mates on the way out, try the GoPro and chat about random things. Once at the lake, we look at all the stuff we brought for the trip. Somehow it all fits, miraculously. Then it’s time to get going. We agree with the guys to be back here in five days by midday. ‘If we’re not back by 5 p.m. that afternoon, we’re dead’, Walter adds triumphantly. Right. 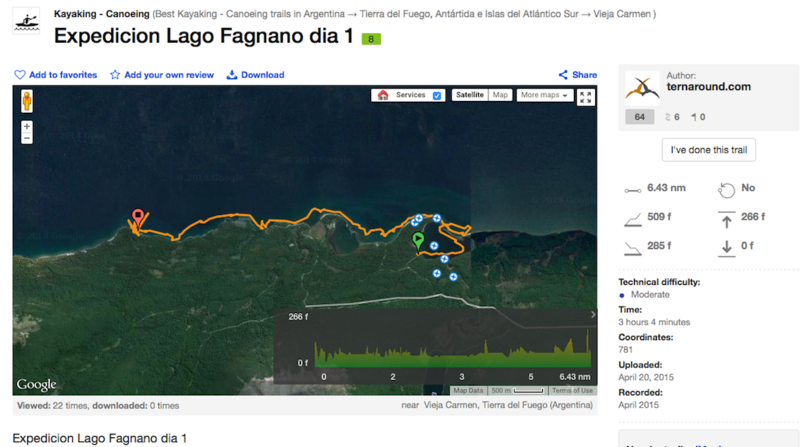 Expedition Lago Fagnano finally takes off on Tuesday April 14th, 5.18 p.m., on a day Ushuaia’s port is closed due to wind conditions. Bahia Bombilla at the lake looks pretty calm on our departure, but winds increase rapidly. We paddle the bay to warm up and find our rhythm in the waves. We laugh. Seems like we have to paddle hard to even make it to the lake. We take it as our first warning. We make a small detour once on the lake and admire our surroundings. It is a sunny afternoon with some clouds. The views are simply beautiful, with mountains and autumn coloured trees in the soft late afternoon light. Walter films our first moments on the lake and, being quite a poet at times, tells me he has been waiting for this lake all his life. Now his dream is gonna come true. His emotion is palpable. We’re embarking on a great adventure. Then we turn, and start heading west, straight against the wind. 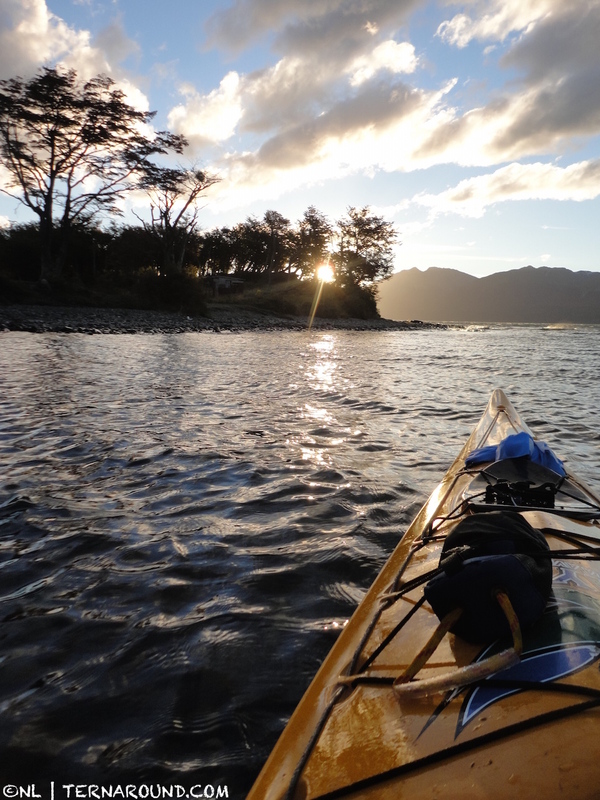 We pass Bahia Palacios and Sur 54 lodge and keep going until the lake treats us to our first wonderful sunset. ‘Lago Fagnano welcomes us’, Walter speaks solemnly. Heading for the lake and the sun. As it soon gets dark, we have to start looking for a beach to set up our first camp on the expedition. The coastline here consists partly of high cliffs and impenetrable forest, with some small pebble beaches. On one of those we pitch our tent, make a fire and fix a line to dry our suits. Over mates and our first bottle of wine we evaluate the first few hours of our kayak expedition on this ‘monstrous’ lake as Walter often calls it. So far so good. We both feel relaxed and at the same time excited. We have absolutely no idea what the lake has in store for us. For now, we count our blessings. Close to the fire we have a dinner of pastas, tomato sauce, fresh cherry tomatoes and parmesan cheese under a million star sky. We are here to live a dream. The moment calls for another bottle of wine. Expedition day 1 – 12 kilometers. 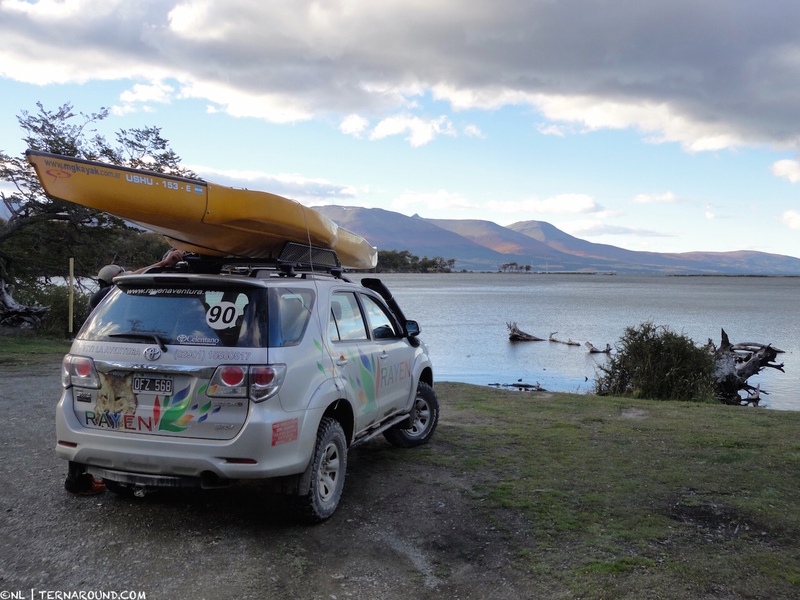 This entry was posted in Outdoor adventure, Tierra del Fuego and tagged adventure, Argentina, expedition, kayaking, multi-day, Patagonia, Tierra del Fuego. Bookmark the permalink.